9", 1997, Blond mohair bear with black floss nose, mouth, and claws, beige wool paw pads. Fully jointed. Book "A Celebration of Steiff " 223 pages of wonderful pictures, some which have never been seen before. 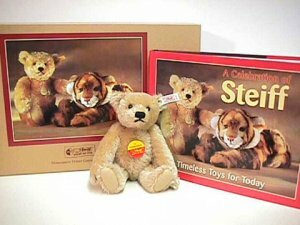 Chapters on the history of Steiff, how the toys are made, and Steiff in the US. Boxed set.